I get a ton of requests for this recipe all the time, and it is my family’s favorite breakfast that I make. 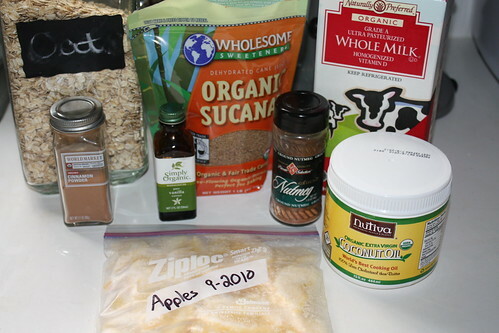 I first found this recipe on Food.com, but have since modified it to fit our healthier eating habits. Combine milk, sucanat, coconut oil, cinnamon and salt in a medium saucepan and heat until you scald the milk. 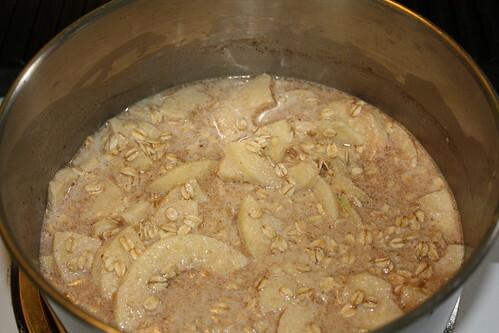 Stir in the oats and apples (I use frozen apples I keep stocked in my freezer), and cook on high for about a minute. 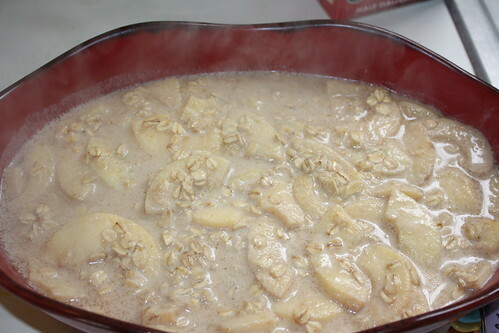 Stir in the vanilla and pour mixture into a prepared baking dish (grease it with a little coconut oil). Bake for 15 minutes, then stir and sprinkle on the nutmeg. Bake for 15 more minutes, and serve with a little milk poured over the the top. It’s a really simple and healthy breakfast, that turns out so creamy and delicious. I plan on making this for Thanksgiving morning. This is a light and healthy way to start out the day without adding a ton of fat and calories to our diets. Give it a try, and I bet you will go back for seconds and thirds. This sounds soooo yummy. We will definitely be trying it this weekend. I found your post on Pinterest, and I’m excited to make it now that mornings are getting cold again. I have a bunch of frozen, sliced apples as well, and I’m wondering if you throw yours into the saucepan still frozen, or do you thaw them first? Thank you! Thank you! This was amazing! We made it with almond milk to make it vegan…and we definitely opted for the optional nutmeg. Three happy tummies! I can’t wait to try this. 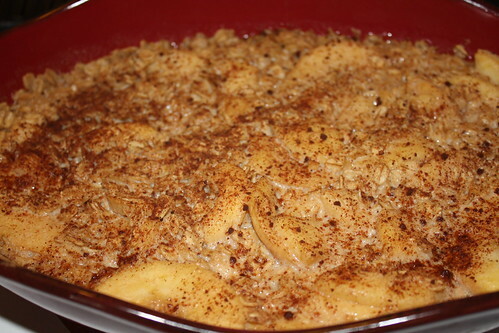 My husband has a sweet tooth and I probably will be making this for dessert. I find that organic apples are on sale a lot where I live so this will be very economical too.